"ANGELINA" - 100 meters to the sea; beautiful territory immersed in greenery; wooden arbors; cafe-bar, wi-fi, near the base guarded parking (fee-based), laundry services (extra charge), transfer (on reservation and prepayment), free wide sandy beach and promenade with lots of entertainment (water park, moon parks, children's attractions , discos, bars and restaurants). Description of the room: Located on the 3rd floor. Common bathroom is on the floor. 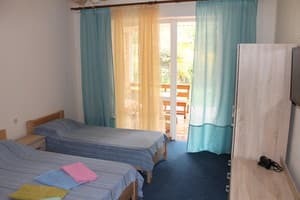 Economy class rooms (6 rooms) can accommodate up to two people. Rooms are equipped with: balcony, TV fan. Bed linen change and room cleaning on the 6th day of stay. The beach can be reached in just 2 minutes. Children playground. It features a terrace, a restaurant and a bar. Babysitting services are available. Description of the room: The rooms are located on the 3rd floor and have a separate exit to the balcony overlooking the garden. 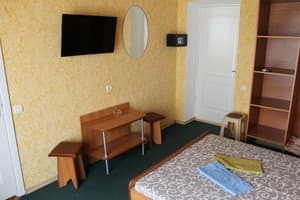 Rooms are equipped with: new comfortable furniture, French windows, bathroom, air conditioning and heating system, LED-TV, refrigerator, safe, hairdryer, kettle. Cleaning in the room and changing towels on request. Bed linen in the room on the 5th day of stay. The beach can be reached in just 2 minutes. Children playground. Delivery to the order number from the restaurant is possible. It features a terrace, a restaurant and a bar. It overlooks the garden. Amenities include a flat-screen TV. Babysitting services are available. Description of the room: Rooms are located on the 2nd and 3rd floors. 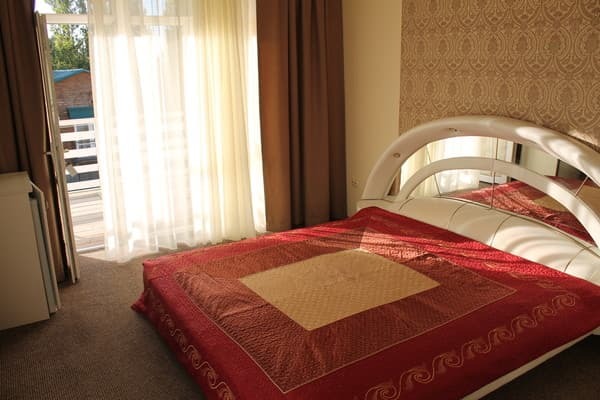 Rooms are equipped with: air conditioning and heating, bathroom, refrigerator, TV. 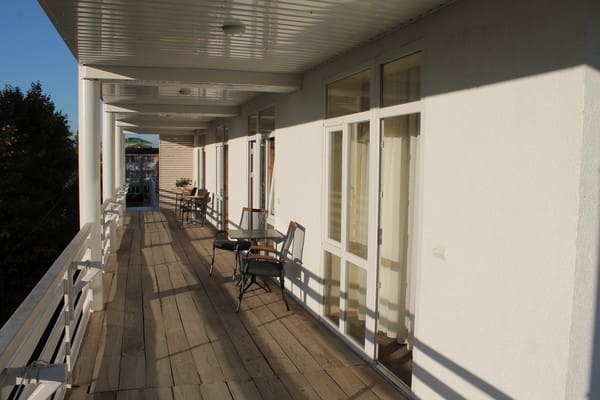 The rooms on the 3rd floor have French windows, separate access to the balcony, carpeted floors, safe, LED-TV. On the 2nd floor there are rooms with a common terrace and a table near the room. Bed linen change and room cleaning on the 5th day of stay. The beach can be reached in just 2 minutes. Children playground. It features a terrace, a restaurant and a bar. Some rooms have a seating area. Amenities include a TV. Babysitting services are available. Description of the room: Located on the 2nd floor. 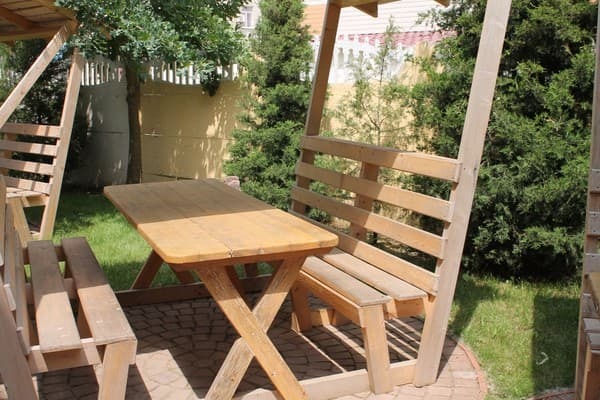 The area of the room is 24 square meters, it has an individual terrace of 10 square meters, the terrace is equipped with comfortable furniture for relaxing. 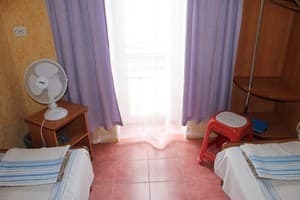 Rooms are equipped with: new furniture, beds with orthopedic mattresses, French windows with mosquito nets, bathroom, carpet flooring, air conditioning and heating, TV-32 inches, refrigerator, safe, hairdryer, kettle. Room cleaning and change of towels at the request of the client. Bed linen in the room on the 5th day of stay. Description of the room: Rooms are located on the 2nd floor with a common terrace, overlooking the green area. 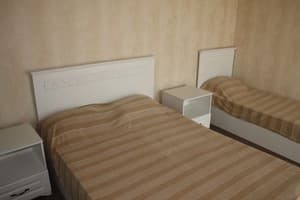 The rooms are equipped with: air conditioning and heating, private bathroom, refrigerator, new furniture, double and two-tier beds, TV. Bed linen change and room cleaning on the 5th day of stay. The beach can be reached in just 2 minutes. Children playground. It features a terrace, a restaurant and a bar. Pets are allowed. Amenities include a flat-screen TV. Babysitting services are available. Description of the room: Rooms are located on the 1st floor. Rooms of 24 square meters, bathroom-5 square meters, have individual terraces of 10 square meters. comfortable for relaxing overlooking the garden. 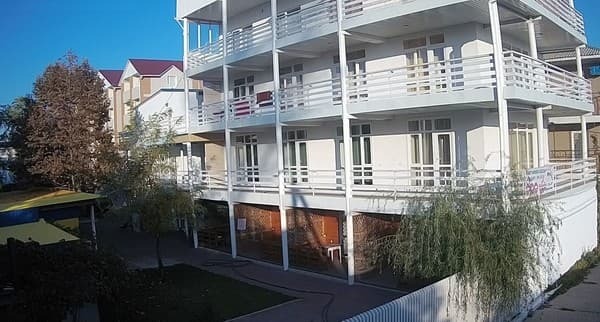 Rooms are equipped with: new furniture, beds with orthopedic mattresses, French windows with mosquito nets, carpeted floors, air conditioning and heating, TV-32 inches, refrigerator, safe, hairdryer, kettle. Cleaning in the room and changing towels at the request of the client, changing bed linen on the 5th day of stay. The beach can be reached in just 2 minutes. Children playground. Delivery to the order number from the restaurant is possible. It features a terrace, a restaurant and a bar. It overlooks the sea. Some rooms have a seating area. Amenities include a flat-screen TV. Babysitting services are available. Children under 5 years old - stay free of charge without a seat. The recreation center provides a complete three meals a day, is not included in the price, and is available for an additional fee. Meals can be ordered as a 3-time or separate. 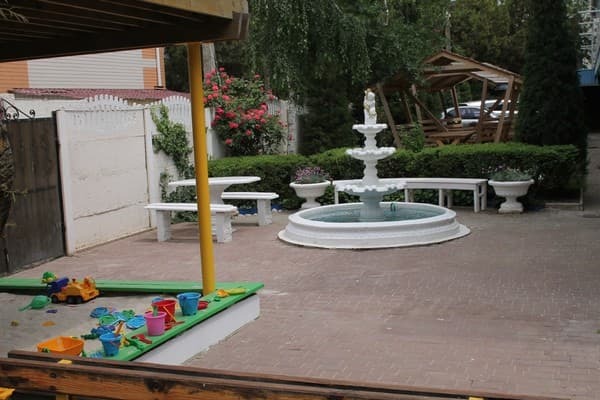 Ukraine, Kherson region, Golopristansky district, s.Zhelezny Port, Shkolnaya St., 55/20.